A few weeks ago I presented a recipe for corned beef slow-cooked in beer on this page that, if the emails I received are any indication, proved to be very popular. Now, I don't know about you but we have no trouble using leftover corned beef when I cook a piece of silverside. It gets gobbled up on sandwiches, accompanied by pickles or mustard, in no time at all. 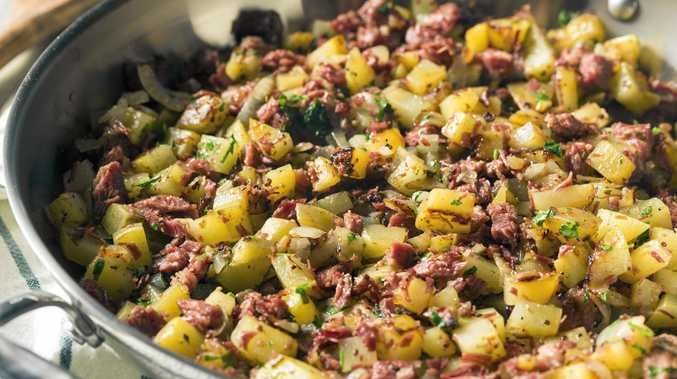 But if you do happen to end up with some leftover meat, try this easy, classic American breakfast dish, corned beef hash. On its own or topped with a traditional fried egg, this is a terrific brunch dish for a lazy Sunday morning. Heat oil in a cast-iron frypan or skillet over medium heat. Add onion and cook for 2-3 minutes, stirring occasionally, until onion starts to soften. Add garlic and cook for a further minute, making sure the garlic doesn't burn. Add potatoes and cook, uncovered, for 10-15 minutes, stirring occasionally. Add corned beef and cook for another 10 minutes, or until meat is heated through and potatoes are tender. Taste and adjust seasoning; you may not need to add extra salt as the corned beef will add plenty. Stir chopped parsley through and serve. Variation: You can use chopped ham, salami or chorizo if you have no corned beef. You can also add a chopped capsicum when you add the meat. Top each serve with a fried egg if you prefer.